Last night I roasted one of the free range chickens we bought last week from Sycamore Creek Farm. I brushed it with olive oil and sprinkled on some lemon pepper, then placed it on a bed of sliced onions and added a little water to the pan. Put it into a 375 oven and baked it until the meat fell away from the bone. I had always heard that free range chickens are tough if not pressure cooked or put into a slow cooker. This chicken turned out to be anything but tough. The skin came out crisp and browned and the inside was moist, even the white meat. As for taste…lots of fresh flavor. The nice thing is that we know where this chicken came from and helped support a local farm. This chicken enjoyed a free life roaming the farm snacking on bugs of her choice, and relaxing in a dust bath. She soaked up the warm sunshine on her shoulders and cooled off with a breeze that ruffled her feathers. Her life may have been short but it was a free life unlike the Big-ag chickens who live in an over crowded building and never see daylight. Years ago Sonny and I never thought of that aspect of our food, but having seen how animals are treated in industrial food processing it is becoming hard to swallow. We can’t always eat only free range farm animals, but we are getting farther and farther from industrial food everyday. We are lucky that we are in the position to this, but also understand that not everyone has that option. 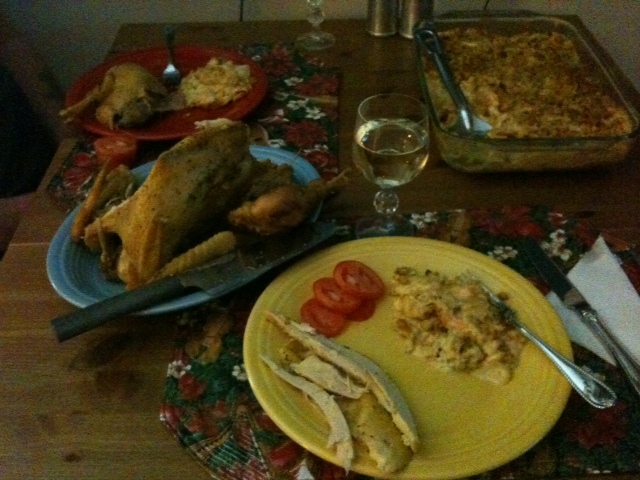 Chicken dinner with sliced tomatoes and squash casserole. I watched a show on TV one time where a person went to visit Martha Stewart’s farm. I sat there in awe as they walked through the horse barn. It was immaculate and the spokes person raved that it smelled of lemons. I would love for my chicken coop to smell of lemons when I open the door in the morning. Unfortunately it smells like chicken poop and if I stand too close to the door as the hens hustle out I just might get a little poop/mud cocktail flung in my direction. I keep the hen house clean but I doubt that it would pass Martha’s inspection. We live in real life. Farming is dirty and smelly. It is blisters, sweat, and dirt caked under your nails. It is nights of soar muscles, with a glass of water and two tylenol for a nightcap. Whenever John and Carol go out of town I take care of their donkeys, two goats, dog and abundant barn cats. Their barn doesn’t smell of lemons and it isn’t immaculate. It smells of hay and donkey sweat with a hint of manure. I love how it all feels. The vibrancy and excitement of the animals anticipating their feed, then the quiet and calm as all are fed. Its a soothing balm for the soul, that grinding chewing pastoral chant and occasional snort from the donkeys. As far as the garden goes, it lies dormant in winters sleep with a covering of donkey manure. Life here has slowed down a bit too, but the animals still need daily care. 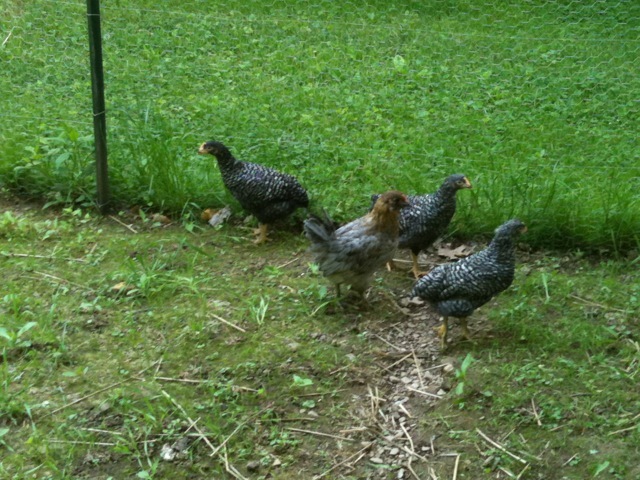 Maybe next year we will have a few goats or meat rabbits to add to our twenty-one roaming chickens, three cats and dog. We may not have a Martha Stewart farm set in perfection, but I can tell you that when I step out and look across our little farmstead, my heart grows two sizes. My feet are growing roots right along with the blackberry bushes and grapes. No offense Martha, but you can keep your farmisneyland, we’ll keep reality. Sonny and I should have been catching up on outside chores today, but instead we went to Sycamore Creek Farm to pick up five meat chickens for the freezer. Al and Julie Bolin raise and process their chickens then freeze and sell them. These are free range chickens that will have a bit different flavor than your grocery store roasters. They will be closer to what our grandparents and great grandparents would have tasted on the farm. Al said the dark meat will be darker the white meat whiter with much more flavor. Al showed us around his farm. We walked on frozen mud as winter cold wind clawed at us. Chickens meandered around the grounds looking at us sideways as if to say “who are these people and what do they want?” The Bolins have a small orchard of fruit trees and two high tunnels. High tunnels are large green houses built from heavy plastic stretched across galvanized metal hoops. Al took us into the high tunnels and showed us his raised beds of spinach, chard and leaf lettuce. Like us he and his wife Julie are striving to be more self sufficient as well as trying to make their farm bring in some income. The inside of the greenhouse was warm and it felt good to be out of the biting wind. The sides of his raised beds were built from two rows of staked concrete blocks that help to hold in the heat and keep the soil warm. Al also showed us his homemade chicken plucker. Its a large blue plastic barrel with rubber nubs attached to a wheel. A small motor turns the wheel and plucks the chickens clean as a whistle. You can see how it works on their Facebook page. Sycamore Creek Farm. They also sell eggs, and produce as the season provides. Al has a wealth of information and experiences under his belt on gardening and farm life. Like most of us on this self sufficient lifestyle journey he has learned most things by trial and error. There are many books and articles out there with info too, but we still seem to learn more from like minded people and their experiences. Oddly enough they also know Lynne and Sandy from Two Lynne’s Farm. We are beginning to become members of a network of people who want the same life as we do. Providing for ourselves and depending less on the outside world of the grid, grocery stores, and food that is packed and transported hundreds of miles. 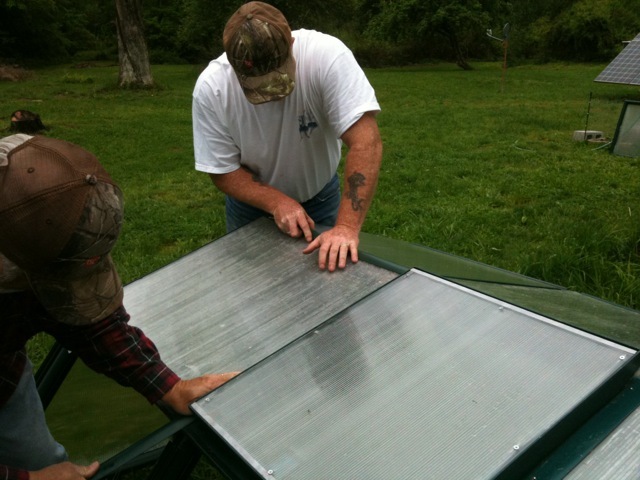 We are rookies and have little experience to share at this point, but we do have one thing that this network of self reliant homesteaders do not have. Living off the grid. That is the experience we can share and teach to those who are interested. In time we too will have the notches of farming experience carved into our hoes and will be able to pass that knowledge on to others. Thank goodness their are others out there, who are considered to be a crazy as us. I was beginning to think the sun had abandoned us. After days of battleship grey skies dropping rain and forecasters who gave unkept promises of sunshine, my mood was turning as fowl the weather. Seeing the sun shine from a clear blue sky was the perfect tonic to cure my soggy attitude. The solar panels sucked up the sunny rays as well and it was nice to be able to vacuum and run the washer without turning on the generator. Even the animals felt better. The chickens puttered around the yard stretching their wings and basking in the warm sunlight. A dust bath would have been the icing on the cake for them, but unfortunately the ground is still saturated and only good for a mud bath. I guess we can’t be too greedy and should be thankful for what we have. 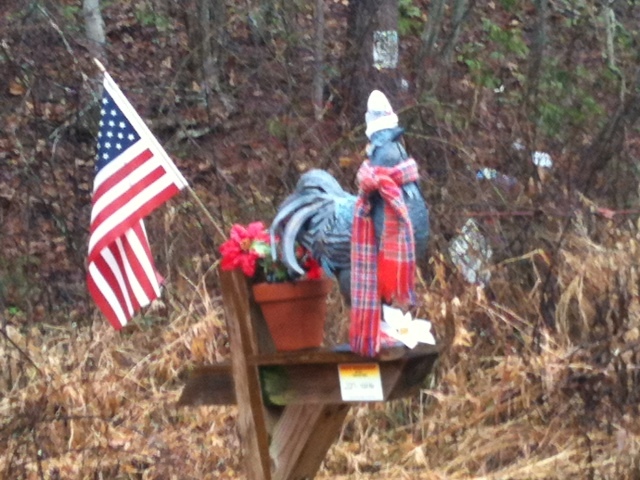 Roo Roo has been festively dressed up for the holidays and stanchly stands at the driveway entrance ready to welcome all visitors who find their way to our door. We’ll soon have Christmas treats to offer while they warm up with a cup of coffee or hot chocolate by the wood stove. All decked out for Christmas. Clarissa and I will be making a trip to Delaware this weekend to make Christmas cookies with the women of my family. Its a family tradition that has been going on since I was little girl and believe me that has been a long time. There have been a few years lately where the weather has interfered and we were unable to go. The guys plan to hold down the fort here at the farm and will anxiously await our return in a car leadened down with tins of homemade cookies. I fully expect to see them waiting on the porch with wide grins and coffee cups in hand as we come up the driveway. Sunshine and the expectation of holiday cookies…. the very thing to raise the spirits of gloomy grump. PHF was full of surprises today. First John and Carol called this morning and offered to come over and help us get the broken down greenhouse back together. I think they got tired of hearing me whine about it or maybe it was having to look at its creepy skeletal frame ominously sitting in the yard every time they came to visit. With stormy black clouds looming above and peeking through its missing panes it could have been a prop for a haunted scene in a horror flick. But no more. Its good as new. We moved it from its original location and put it across the driveway opposite of the garden. This way if we want to expand the garden some more we have room and don’t have to try to relocate the greenhouse again. Everything went back together just like it was before except that we could not tell which side of the panes were UV resistant. When we originally installed the panes the first time they had a sticker attached that indicated the UV side. Of course we removed all of those before the wind blew the greenhouse to kingdom come. The company said if the wrong side was facing out it would turn yellow in a few years. 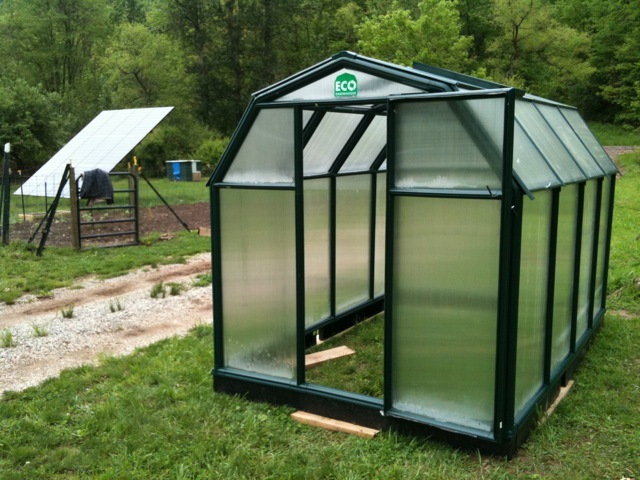 Well, we can’t do much about that and it won’t interfere with the performance of the greenhouse in any way. It might just look like a patchwork quilt in few years with its yellow and white panes. Oh, and it is anchored down too. We still need to put some gravel in the inside, but it is ready to start new plants whenever needed. While we were working on the greenhouse John heard a guinea call from the direction of the pasture next to the driveway. It was not one of the three guineas milling about and one of the males immediately went running toward the direction it came from. 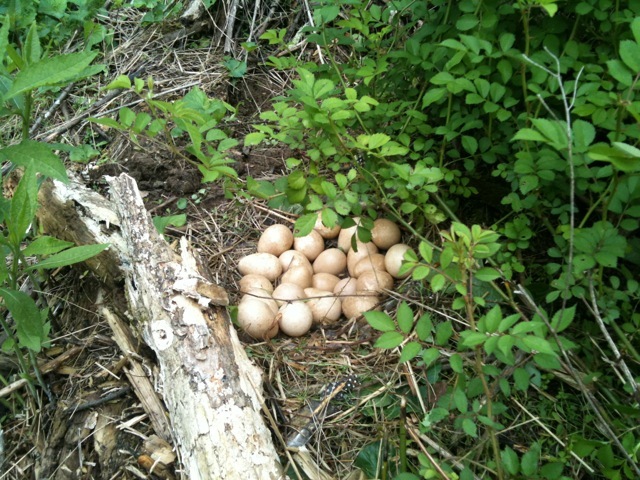 Carol and I walked over and searched to see if we could find a nest. There must be one. We looked deep into bushes and grass but could not find anything until all of a sudden Carol yelled “There she is.” She was in plain sight and we had looked all around her. She was sitting with her wings spread slightly out protecting her nest of eggs. 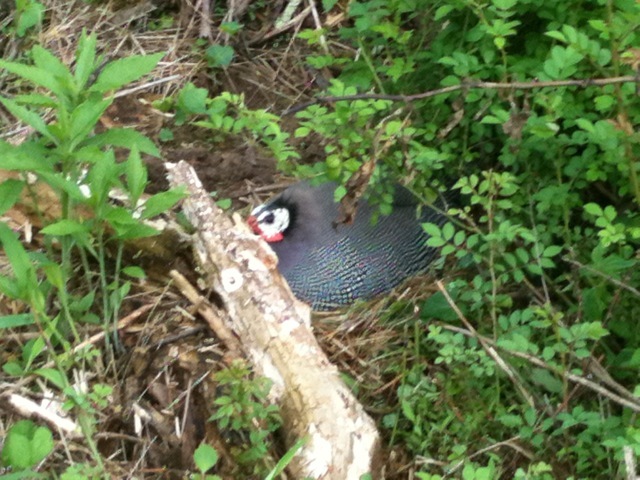 Later when she went to feed we snuck back to see how many eggs she had in the nest. She is sitting on about twenty-two eggs. We are so excited that we may have some little guineas, but I have read that guinea mothers are not the best moms. Most of the little ones do not survive due to the fact that the mothers take them out into the wet grass and they get cold or predators get them. Sonny and I are debating on whether or not to move her nest into the dog kennel and put it into the pole barn or let nature take its course. I don’t know if by disturbing the nest she might abandon them or not. It would be wonderful if we could successfully raise the first babies born to PHF. Yesterday when I went to town I looked for some onion sets to buy. Of course I am always a day late and missed the rush on onions ( I can just picture frenzied gardeners with shopping carts pushing each other like a roller derby match toward the onion set display). I did manage to find a mixed bag of onion sets hidden in a corner containing twenty each of red, yellow and white bulbs. It must have been bumped out when two carts clashed during the onion derby and rolled to a corner to seek safety. Our victory. We may as well have an assortment of onions. The red onions are great for grilled shish ke-bobs. My first order of business this morning was to get the onions planted. I also planted my yellow straight necked squash plants I picked up yesterday from Lowes. Since the greenhouse catastrophe nixed starting any zucchini plants early I went ahead and made three hills and put four seeds in each. 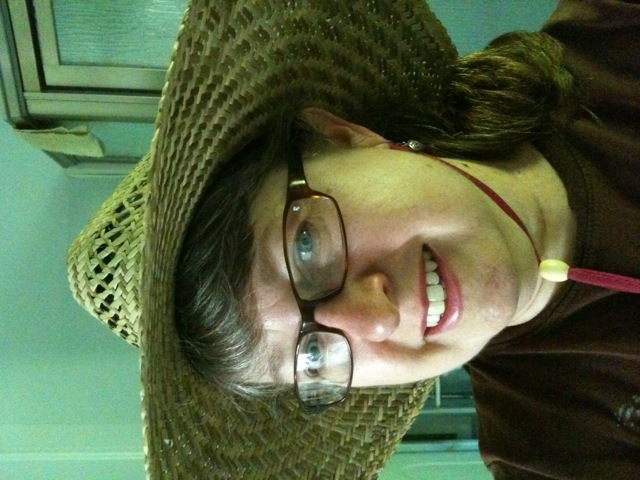 Walking through Tractor Supply yesterday I found a nice straw garden hat that fit just right. The straw is woven in a pretty pattern on the crown to give my hot head some ventilation and it has a string tie so it doesn’t blow off in a strong breeze. The brim is big enough to keep the sun off my neck, but not so big like some hats that can shade the person next to you too. I wore it today while I was working in the garden and I have to say I give it an A+ for comfort. Ready for work and stylish too. The little chicks are starting to become more comfortable in their surroundings. Today they ventured out into the coop pen for the first time. It started off with one brave barred rock that tentatively peeked out of the open hatch and then stepped out onto the ramp. She cautiously put one dainty foot in front of the other and went slightly further out until she caught sight of a bug and threw caution to the wind to catch it. The rest of the teenybopper flock soon followed and the bug games began. Soon they will take an even bigger step and blend in with the older flock off to explore the wonders of PHF. Whose There? Where did it go? Wow, it’s hard to believe that we are already in the month of May and even harder to realize how long its been since my last blog entry. I have no excuses. Since the rain for the past weeks has put a damper on doing outside projects I have been spending my time doing a little Spring cleaning in the house. The walls and cabinets have been scrubbed clean of the winter wood stove residue and the glass of the inside windows is now gleaming. I washed the sofa slip covers and hung up Springtime fresh curtains. Now that those chores are completed I can spend most of my time outdoors where I really want to be. Sonny took a weeks vacation this past week so that we could finish up the drain ditches, the wood shed addition, work on the garden, finish up the hog pen fence and about a thousand other things. Of course it rained the first part of the week and then he had a little mishap. We had taken Festus, (Johns Truck) to Southern States Supply to get a couple of propane bottles filled. The tanks were filled and Sonny started to climb off the back of the truck when his heel got caught on the edge of the tow hitch. He fell like a sack of potatoes onto the asphalt and injured his right shoulder. I took him to the Urgent Care and the X-rays didn’t show any fractures, but his shoulder is still extremely painful if he tries to lift his arm too high. He will get a follow up done this week. Sonny tried to get some things done, but trying to use a shovel or put the metal roof on the wood shed extension was out of the question, so was putting the green house back together. I am just grateful he didn’t break his neck. We have four new additions to PHF. 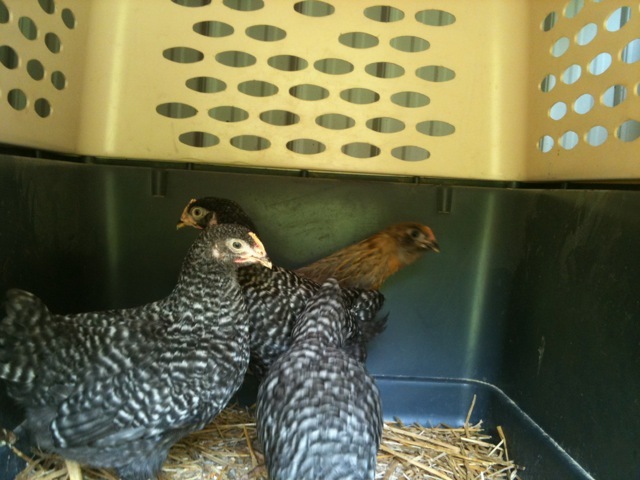 Yesterday we went to Two Lynnes Farm and came home with three Barred Rock hens and an Americana/ Cochin mixed hen. They are about eight weeks old and as cute as be. I can’t wait to see them tootling behind the rest of the flock but that will have to wait a few weeks. I promise to post pictures later. We also came home with some cabbage and brussels sprouts seedlings and two pint jars of Two Lynnes Farm Maple syrup. Can’t wait to try that! My day has been a busy one. It seems as though it has taken me forever to put up the chicken wire around the bottom of the garden fence. The chickens weren’t free ranging last year but now they hop in and out of the large square openings of the cattle fencing like its a hop scotch game. My fingers are soar from wire tying the chicken wire to the existing fence and let me tell you those raw, sharp ends of the fence can poke too. Wearing gloves just gets in the way so I will suffer the consequences of not wearing them. Now that the chickens can’t get into the garden I went ahead and planted the cabbage plants and two rows of Strike beans. Our friend Gary gave us some potato starts and I cut them in half so I can plant them tomorrow. My fingers are soar and my hands are scratched, my back aches and my muscles scream but I feel good. I finally finished a job that needed to be done and the garden has its first plantings. We have four more beautiful hens that will give us eggs in a few months and it is a good feeling to know that we can feed ourselves. Well as long as the garden grows.